The Centralia City Council has found Mayor Elect Bryan Kuder has failed to meet the residency requirement and has declared the Mayor’s office vacant as of May 13th when Kuder was supposed to be sworn in. The attorneys for Kuder indicated after the Tuesday night meeting there would be a next step, but declined to say what it would be. The most damaging evidence presented by the city was a tax form and a mortgage on a home the Kuder’s purchased in Washington County where Kuder had the signed the documents indicating the home would be his primary residence. City Attorney Douglas Gruenke concluded his legal opinion by saying Kuder had failed to qualify as Mayor. City Manager Dan Ramey said he had contacted another attorney who deals with municipal law who concurred with Gruenke and said the city council has to make the decision. Kuder’s attorney Lane Harvey countered that after selling his home on Circle Drive, Kuder had his mail, voter registration, and drivers license all changed to the West Broadway address where he had rented a one bedroom apartment. Harvey said that showed Kuder’s intent to reside at the apartment in Centralia. Harvey says a water leak had made the apartment uninhabitable for about 30 days forcing Kuder to live at the Washington County home, but as soon as repairs were made Kuder moved into the apartment. After the meeting, Kuder’s attorney Nicole Villani said her client had not been given due process and they were only notified on Friday the issue would even come before the city council. Councilman David Sauer made the motion to find Kuder ineligible to serve as mayor. He said it was plainly the council’s responsibility to act on the issue, but ultimately there needed to be a court ruling to protect the city from issues that could arise from having an ineligible Mayor in office. Councilmen Bill Smith seconded the motion and Councilman Andre Marshall also voted in favor. City Councilman Howard Jones, who ran unsuccessfully for mayor, abstained. Jones later announced his only intention was to complete his two-year term on the city council. 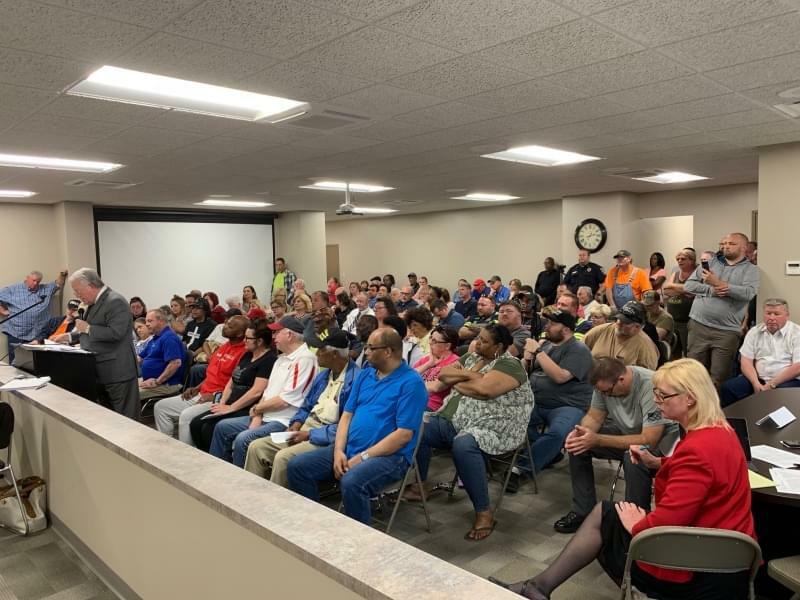 Two members were ejected from the meeting after yelling comments at the council about the process used for the meeting. Others expressed their displeasure with the council as the meeting broke up. A few were not allowed into the meeting because doing so would have violated the fire code for maximum capacity. Kuder was in attendance but did not say anything during the meeting. 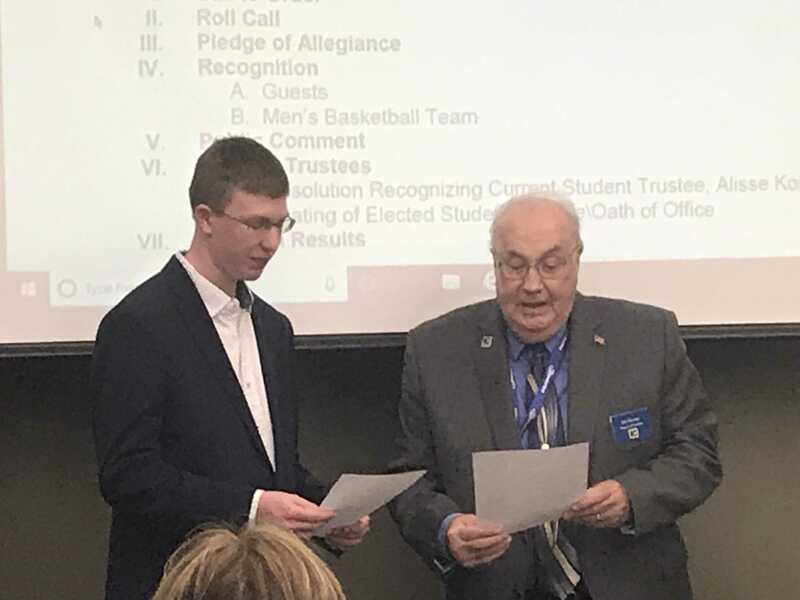 The Kaskaskia College Board Monday night approved a number of personnel moves. They include establishing a full-time faculty positions for the College’s new Health Information Technology Degree and Resident/Commercial Electrical Technician Programs. Both programs will begin in the fall. The Health Information Technology Program prepares students to organize health information data for hospitals, clinics, doctor’s offices and more. This program is being offered wholly online. The Electrical Technician Program will prepare students for entry-level positions in an electrician career, and will be offered at the College’s Trenton Education Center. Correctional Center, Alexander Koopman of Breese as Information Technology Support Technician, and Amy Sapp of Salem as Testing Specialist in the Academic Center for Excellence (ACE). The board reappointed the College’s Professional Managerial and Executive Managerial employees for the 2019-20 fiscal year, and honorably discharged grant-funded employees at the end of the current fiscal year. The employees will be retained should funding continue in the new fiscal year. 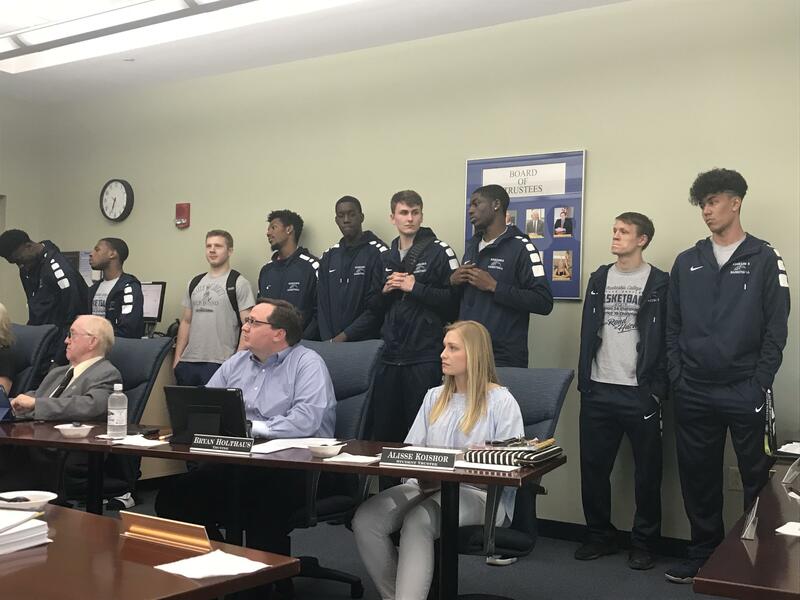 The board recognized the KC Blue Devils Basketball team for their season which saw the team win the Region 24 and District 16 Championships and make the Sweet 16 in the National Junior College Athletic Association Finals. The Kaskaskia College Board has seated Justin Huff of Mt. Vernon as student trustee for the coming school year. 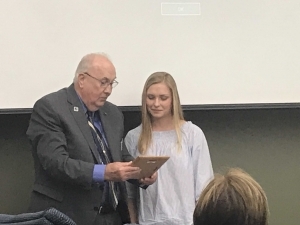 The board thanked outgoing student trustee Alisse Koisher of Highland for her service. The board also formally accepted the resignation of longtime Trustee Dr. Dee Boswell of Centralia. He has served on the board since 2011 and stepped down for family reasons. The Board scheduled a special meeting for April 29th to certify the April election results for Bill Hawley and Linda Stover who were re-elected to their seats, reorganize the board and interview candidates for Dr. Boswell’s seat on the board. Another special meeting was tentatively scheduled for May 9 at 5:00 p.m. to seat the new trustee. City Manager Dan Ramey, Gary Klingele with Innovative Facilities Solutions, Tom Walsh, Bob Kelsheimer, Ralph Caudill, Patty Hinton, Bryce Foltz, Brian Britton, Becky Ault, Jay Luse, Tina Suarez, Chris Lyons, Tom Kasten, Jack Mays, Crystal Lyons, Sonya Germann, George Hinton, Deb Elling and Russ Goodiel gather to celebrate reaching the $200,000 goal to light one of the Rotary Park ball diamonds. 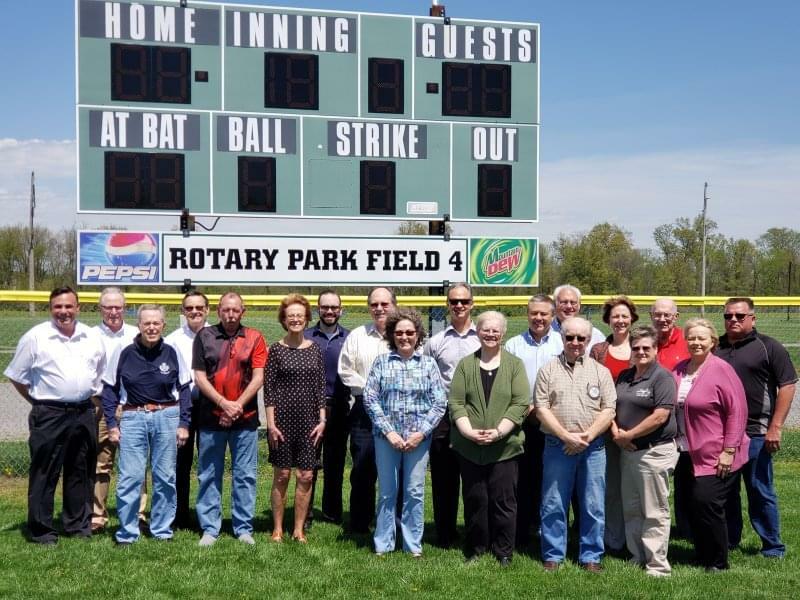 The Centralia Rotary Club has raised the $200,000 needed to light the first field at Rotary Park to allow night play. Members of the club joined the City Manager and Representative from Innovative Facilities Solution at the field at the Walnut Hill and Perrine Street Road to mark the occasion. The goal is to have the lighting in place by late summer. Fundraising is continuing to light at least one more of the fields at the park. The SCHS Board made several changes to the student handbook including a new grading scale and new parking permit rules with the new parking lot. Superintendent Brad Detering explains. Detering reported the reaction to the new Student Resource Officer have been positive. 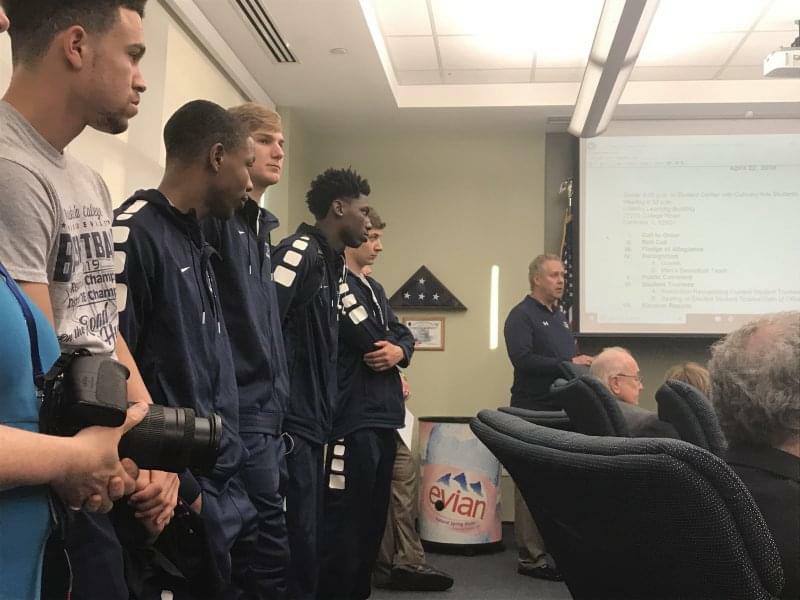 The officer has gone into several classrooms and made small presentations and has even played with the high schools E-sports team on his own time after school. The board was told three students are only one truancy away from facing court action after missing ten days of class. Assistant Principal Kelly Conklin reported four suspensions in the past month for drug use, and one suspension apiece for aggressive behavior, having a weapon, which was a knife, and assault. The board approved the resignation of assistant bowling Coach Kayla Harris. The last day for seniors who don’t have to take exams will be May 13th. Seniors who have to take exams last day will be May 15th. Other students will have their last day of exams on May 28th. Graduation will be on Sunday, May 19th at two pm.